Even though I was derailed for about two months on my Personal Beauty Detox Journey– gaining a total of 12.5 effin’ pounds!! (I know: seriously?! )– I seem to be heading back on track. [Fingers crossed.] [Knock on wood.] [Salt tossed over my shoulder for extra good measure.] And as of Sunday the 5th, I have actually taken the plunge and incorporated one of the major, signature tenets of Kimberly Snyder’s program: the Glowing Green Smoothie. I have a thing with food textures, remember, and in my mind, green things are not supposed to be soft, smooth, or creamy whatsoever. (That’s why it took me 28 years to enjoy eating avocados.) I’ll admit I was terribly nervous about shoving a head of romaine lettuce, half a bunch of spinach leaves, some celery, and some fruit into a blender and then drinking it down. Being faced with nearly a litre of emerald green drink to down (every day!) did not seem like an obstacle I could overcome successfully. But everything in my life started pointing me in the inevitable direction of the Green Smoothie. First, I read Kimberly Snyder’s book, “The Beauty Detox Solution”. Did I jump right on the smoothie bandwagon after reading her incredibly inspiring book? No, but I did start incorporating some of her other suggestions. I was just a little nervous about all that blended green drink. Next, I attended that powerful talk by Tim VanOrden. He was incredibly motivating and also talked about drinking Green Smoothies every morning. Did I head home that evening and triumphantly drag my Vitamix out of its cubby? Still no. Finally, I happened to pick up a book called “Green for Life” at the local raw foods café while I was waiting for a gorgeous take-out salad to be made. I started thumbing through it mindlessly, and the few pages I read were what eventually convinced me to take the plunge. 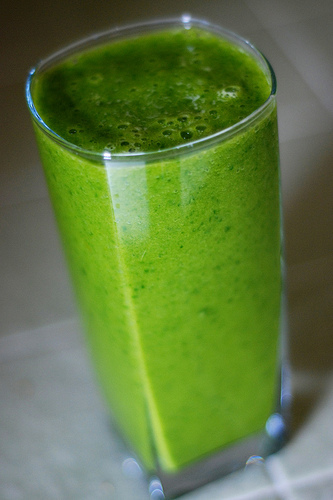 I’ll confess it was mostly vanity that inspired me to make green smoothies every morning. Cough. The author of “Green for Life”— Victoria Boutenko– talked about the power of green smoothies to a) regulate sleep patterns and nourish the body on less sleep each night, and b) potentially heal even lifelong sores on the body. Seeing as we are so busy at the Harbour these days, the thought of being able to rejuvenate on less sleep every night was very appealing to me. (Maybe we can build our way up to working 22 hours a day?? Heh.) Also, I’m ashamed to admit that I still have that nasty, not-so-girly foot affliction, so even the possibility of having it drop off effortlessly after many years of trying to get rid of it was enough to turn me in the direction of blended green drinks. Yes, I started drinking smoothies because of a wart. Ahem. I have to say, I am loving both my morning smoothies and the fact that I own a Vitamix blender. Seriously. I don’t think I could keep it up if I had to chop everything into tiny pieces and then down a still-grainy “smoothie” from a non-Vitamix blender. The first morning, I was paranoid about over-blending the smoothie (in case all the rapid-fire blending action caused the smoothie to heat up, which I would not have been able to tolerate.) So I didn’t really blend it enough. It came out kind of chunky, luke-warmish, and admittedly nasty. And yet I drank it down for the sake of my health and non-girly warts falling off. The second morning, I declared to myself that I would blend the hell out of those vegetables, and guess what? My Vitamix rendered the greens, celery, apple, pear, and banana into a heavenly-textured confection. It was silky, it was fresh, it was just the right thickness, and it was delicious. Yes, it took a bit of mental maneuvering to move past my mind’s alarmed insistence that This drink has vegetables in it!! DON’T DRINK IT!! !, but once I grew up and focused on how delicate and fresh the taste was, I was hooked. I have been mowing through greens and fruits in the nearly two weeks since I started drinking the smoothies. I’ve also become emboldened in my smoothie making and experimented with other greens and fruits every now and again. In place of romaine lettuce, I’ve used dark kale leaves. Instead of spinach, I’ve tossed in generous portions of swiss chard leaves. I’ve used parsley sprigs, cilantro, raspberries, blueberries, and I even have some nectarines ripening to try them out in a future smoothie. All of the drinks have been divine. When I drink them, it’s like my body has been wandering in a dusty desert for months and is finally being quenched at some blessed oasis. Every one of my organs seems to sing when I drink the smoothie, and I’m beginning to feel like a bit of a super-hero because of it.